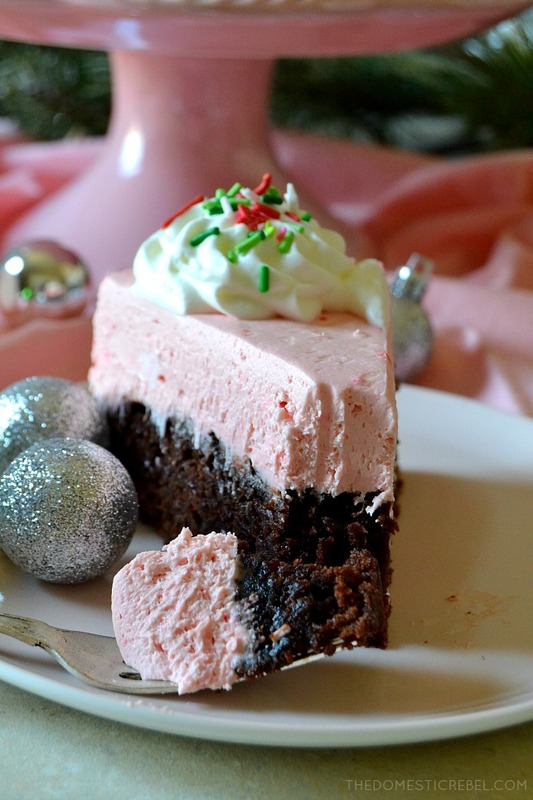 This Peppermint Brownie Cheesecake is such a show-stopping dessert for the holidays! 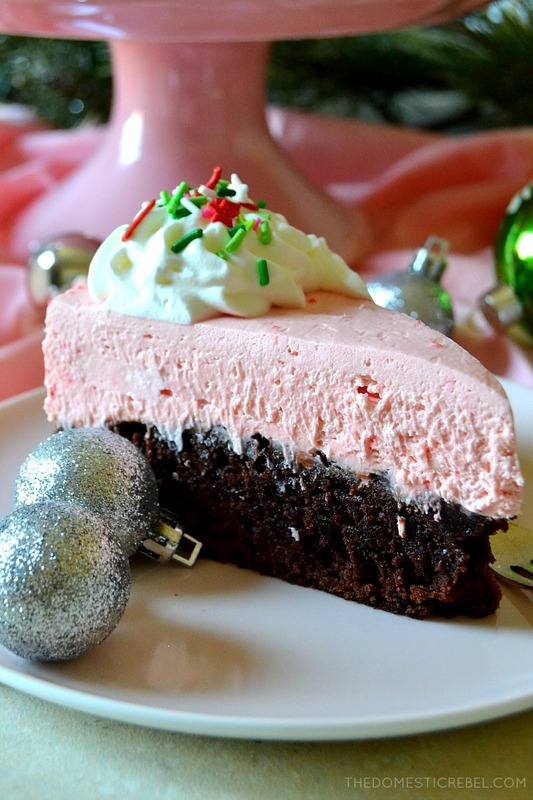 Creamy, no-bake, peppermint-y cheesecake tops a fudge brownie base in this delectable wintertime dessert! I am a woman possessed by the Christmas spirit. You may not know this about me, but I tend to dress very vintage and retro with a pinup twist. It’s how I’ve always felt most comfortable! And now I’m trying to phase mid-century and vintage things into my home, so decorating for a vintage Christmas has been fun every step of the way. From bottle brush trees to cutesy Lefton figurines, it’s finally a space that matches how much I love my fashion style. Plus, women in the 50’s were not shy about color, so I love all the mid-century inspired Christmas decor in pinks, jade greens, yellows, and turquoise blues. But enough about my home decor: let’s talk about this dreamy cheesecake! When I was thinking of the idea of this recipe, I was married to the idea of a no-bake peppermint cheesecake but was torn on the foundation for the cheesecake. Oreos are a classic, of course – but I wanted something a little more special for my favorite time of year. When I scoured my pantry for ideas, I found a lone box of fudge brownie mix and knew it had to be the base for this fantastic Peppermint Brownie Cheesecake! You start with the fudge brownie, which as the name suggests, is ultra fudgy and rich! I used my fave box mix because it’s the best one I’ve tried and always bakes up perfect. Prepare your brownie mix according to package directions, then pour it into a greased and parchment-lined springform pan. This pan is necessary because the sides of the pan detach, so you have a pretty presentation and it’s so much easier to serve! You can find springform pans literally anywhere, from places like Sur La Table, to Amazon, and even discount home stores like HomeGoods and TJ Maxx. Bake the brownie for around 35-45 minutes or until a toothpick or cake tester comes out clean or with moist, not wet, crumbs. Cool it completely (like I said, you could totally make this days in advance or even weeks if you froze it! Just let it come to room temperature if frozen). 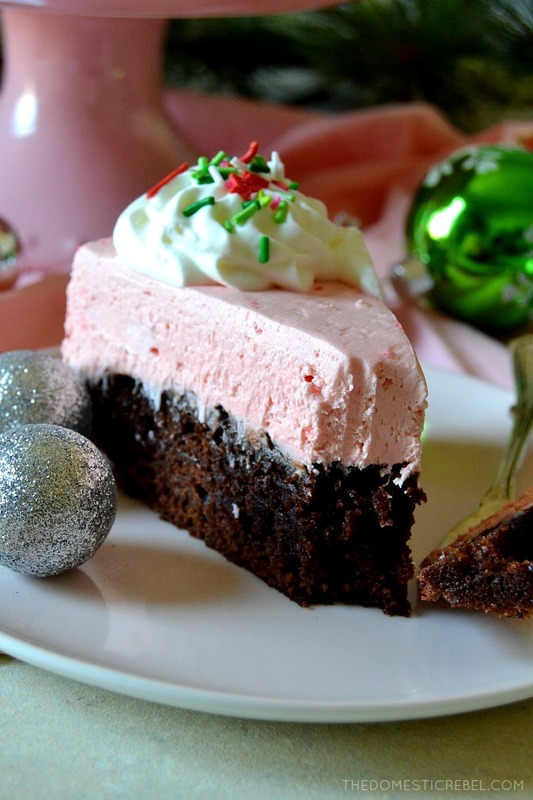 Once the brownie is ready to go, you’ll make your peppermint cheesecake! The key components to this cheesecake are: cream cheese, sugar, peppermint and vanilla extracts, whipped topping, and Andes Peppermint Crunch Baking Chips! These are a seasonal chocolate-chip type product that taste like peppermint and are usually found on the baking aisle or seasonal aisle near the chocolate chips. Because they’re white and red, they’ll turn your cheesecake the most delightful shade of pink and impart so much creamy, cool peppermint flavor. You’ll make your cheesecake and spread it over the cooled brownie in the pan in an even layer, then cover and refrigerate until set – about 6 hours or overnight. Just before serving, garnish with fresh whipped cream and sprinkles, or crushed candy canes! 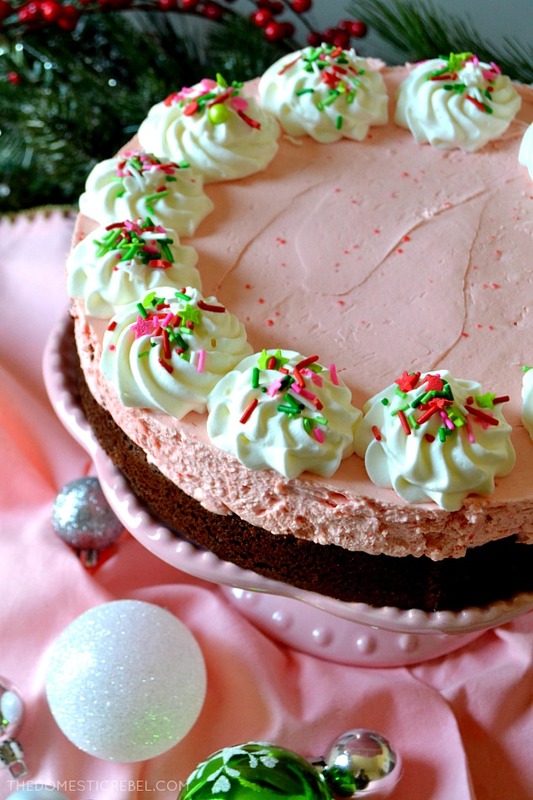 I love how easy, impressive, and show-stopping this delectable pink peppermint cheesecake is! And more importantly, I LOVE the flavor! 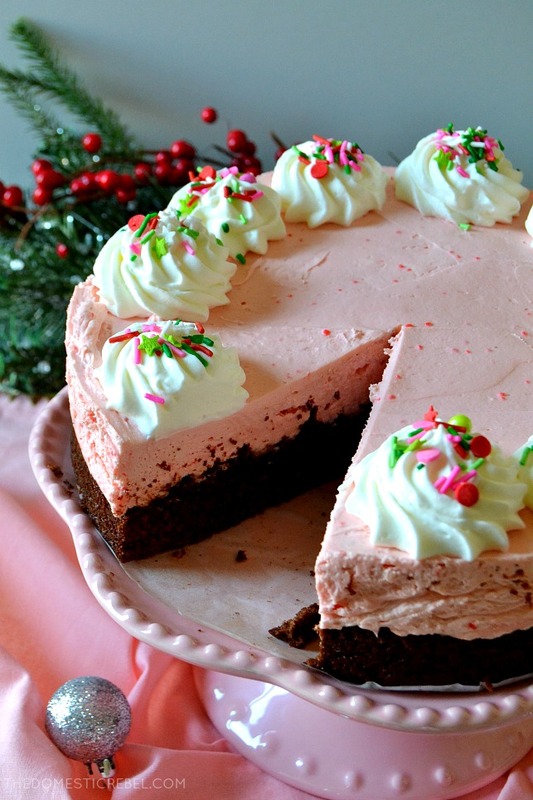 The combination of a cool, creamy peppermint cheesecake with a fudgy, rich brownie is incredible. 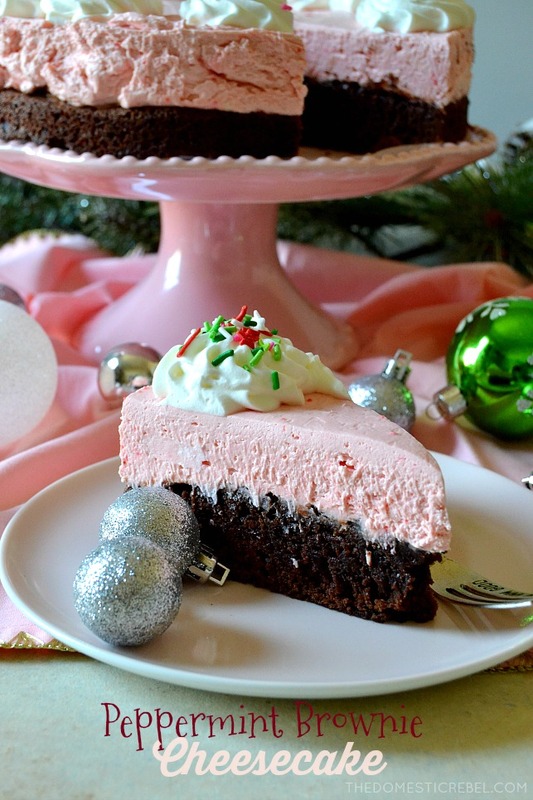 This Peppermint Brownie Cheesecake is one of my newest favorite desserts! Cool and creamy peppermint no-bake cheesecake sits atop a fudge brownie in this delectable mash-up! 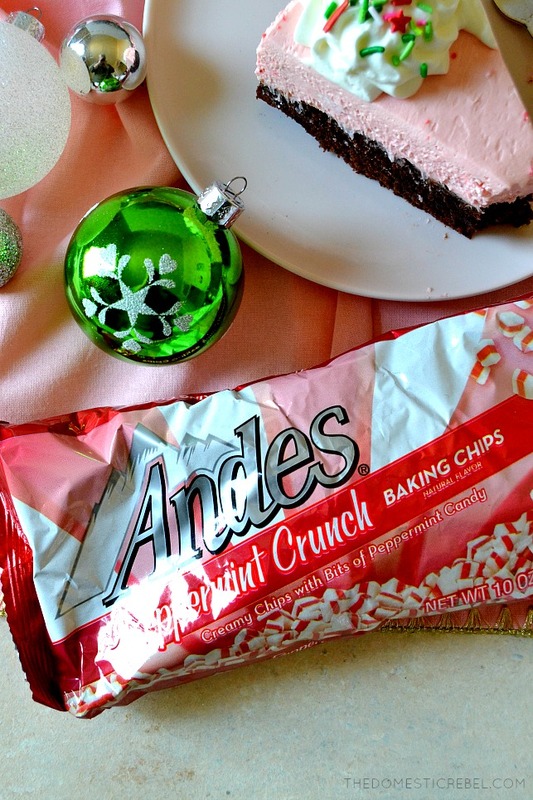 Perfect for the holidays when you need an easy, show-stopping dessert! Preheat oven to 350 degrees F. Lightly grease a 9" round springform pan with cooking spray. Place a parchment paper round in the bottom of the pan, then liberally grease the bottom and sides of the pan once more with cooking spray. Set aside. Prepare the brownie mix according to package directions. Pour the brownie batter evenly into the springform pan and bake for 35-45 minutes or until a toothpick or cake tester inserted near the center comes out clean or with moist crumbs. Cool completely. In the bowl of a stand mixer, cream together the two packages of cream cheese and the confectioners' sugar until light and fluffy, scraping the sides of the bowl as needed. Add in the vanilla and peppermint extracts until combined. Meanwhile, combine the heavy cream and peppermint chips in a small bowl. Microwave 30 seconds, stir, and melt another 10-15 seconds or until melted and smooth. Add the melted peppermint chip mixture and mix well. Lastly, fold in the whipped topping until smooth, thick and creamy. Spread the peppermint cheesecake mixture evenly on top of the fudge brownie layer. Cover and refrigerate for 6 hours, up to overnight, until set and chilled. Just before serving, garnish with whipped cream, sprinkles, and/or crushed candy canes. Disclaimer: this post contains an Amazon affiliate link. If a purchase is made using my link, I will receive a small commission at no additional cost to you. Thanks for supporting the brands that keep my blog alive!